Just three months after making its debut in Detroit, the Lexus LS flagship sedan is back in the US for the New York Auto Show, but this time it’s being presented as a sportscar, rather than simply a luxury full-size executive sedan. 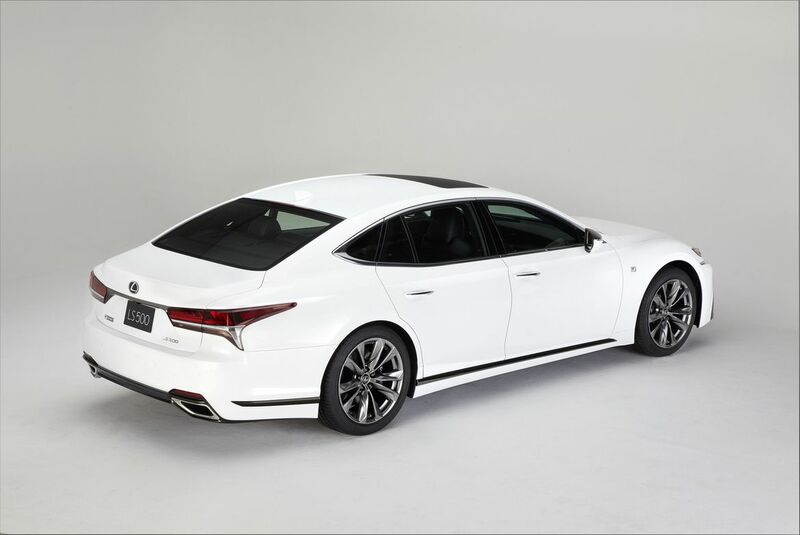 The 2018 Lexus LS 500 F Sport, to give it its full name, promises to enhance hands-on involved driving pleasure but not to the point where your passengers will be anything less than completely comfortable. The changes from the standard sedan start with the styling. The car has pronounced side sills, a reformed trunk lid, a more dynamic front grille and bigger brake-cooling vents on either side. It also sits on 20-inch alloy wheels. The show car, which will make its debut on April 13, is finished in Ultra White which is a shade specially reserved for this model. Inside, it’s a similar story. The front seats are of the sports variety with extra support for when the car is negotiating bends at speed. There’s a sports steering wheel, aluminium trim details and perforated leather. For a final sporting touch, it also uses the same digital speedometer and odometer display that were developed for the Lexus LFA supercar. Beyond the cosmetic customisations, the chassis has been given a serious tune-up, so that it feels stiffer and more responsive. The digital stability aids have also been recalibrated so that pitch, roll and yaw are kept under control automatically, to ensure the car stays flat and passive for the passengers, as well as to allow the driver to use more of its 415hp more of the time. On the subject of powertrain, it will be available in two versions — the first as a 3.5-litre twin-turbocharged V6 mated to a 10-speed automatic transmission and good for a 0-60mph time of 4.5 seconds. Alternatively, the 500h hybrid set-up combines a 295hp gasoline motor with a 59hp electric motor for better fuel economy, but a slightly slower sprint off the line (0-60mph in 5.2 seconds). Both powertrains come with the option of rear-wheel or all-wheel drive set-ups.